As a top New York spa, we know how important it is to keep up our reputation and continue to bring the best products and services for nail care, waxing, facials and massages to all of our clients. That’s why when we found out studies have shown that beauty products such as body oils, body waxes, face-wipes and the like frequently use chemicals and synthetic materials to add a pleasant fragrance to their products, we realized that’s something we won’t stand for at Dyanna. More often than not, the exact chemical ingredients included in these non-natural beauty products are not listed in detail on the product casing. Users thereby remain unaware of the harmful side-effects which these products could potentially have on their skin. The pores that make up every inch of our body need to have constant contact with clean air in order to breathe properly and thereby retain their natural glow. However, the toxic materials added to supply odor to many non-organic substances can actually block our pores and obstruct that clean supply of air from entering our skin. At Dyanna Spa, we recognize that natural products are of utmost importance when dealing with skin-care. Our entire selection of creams, moisturizers, oils and the like are carefully chosen to ensure that any treatment which your body receives at Dyanna Spa will leave you feeling rejuvenated and cleansed in every way. From face-masks to foot creams, your skin will encounter only top-of-the-line all-natural ingredients, including herb extracts, vitamins from plants and minerals and fragrances emanating from fruit peels – allowing you to experience maximum health benefits after each spa visit! Do you ever wonder how flower and plant extracts are converted into essential oils safe to use on skin? The process is a long and carefully crafted one in which the exact location in a plant which contains the most highly concentrated mineral content will be extracted and distilled, using advanced steam or water distillation techniques. The raw healthy materials that remain are then inserted into the lotion or cleanser that you apply onto your skin – thus allowing you to nurture your skin with the same healthy ingredients you aim to give your body! For more information about Dyanna Spa’s products and services, or to schedule your appointment, please visit http://dyannaspa.com or call us at 212-995-2355. Dyanna Spa in New York Praised On Cityist.com For Its Charm And Excellent Service! Your favorite Manhattan spa gets a pat on the back yet again for its unwavering desire to serve clients with individual care and attention. Rated “Best New York Spa” for two consecutive years in a row on popular voting sites like Citysearch, even the beauty experts at City Magazine’s Cityist.com offer a flattering shout-out to our professionalism and service par excellence. Read the review, and then please stop by to try us out for yourselves! SPA WEEK SPECIALS AT DYANNA SPA in Manhattan are available all throughout the months of September & October! New York City Spa week is just around the corner, and while everyone scrambles to book their appointments at Manhattan’s Best spa’s at low prices, Dyanna Spa offers its clients a rare opportunity: it’s a time for you, our beloved clients to pamper yourselves with new and exciting treatments you’ve always wanted to try. The best part is, you have a whole month to do it! Last year, our Caviar Facial was a hit during spa week. So this year we are offering three of our most popular treatments at discounted prices, so book your appointment for this month OR buy a gift certificate to make this offer last all year! The Fusion Massage is a combination of our Deep Tissue, Swedish, and Reflexology massages to give you the ultimate relaxation. The Deep Tissue Massage relieves your muscles of stress and sports related muscle tension, the Swedish massage will improve your blow food and releases toxins from your muscles, and the Reflexology massage effectively works through your pressure points in your hands and feet to relieve tension, aches, and pains throughout the body. The combination of these three techniques is guaranteed to put a little pep in your step. SPA WEEK PRICE: $50 (vs. Regular Price, $80) … YOU SAVE $30! The Jelly Pedicure is designed to exfoliate as well as hydrate dry skin. It really is the ultimate relief from stress and your feet’s aching muscles.The Jelly Pedicure combination with the Brazilian Keratin Manicure guarantees the softest skin and the strongest nails. This water-less, cream-less treatment uses specially lined gloves to moisturize your skin and strengthen your nails. This process is an all natural method that will actually help your nails grow! Not only will your nails be benefiting but so will your muscles with the Reflexology Massage. Designed to give you the ultimate relaxation. Reflexology effectively works through your pressure points in your hands and feet to relieve tension, aches, and pains throughout the body. SPA WEEK PRICE: $50 (vs. Regular Price, $78) … YOU SAVE $28! The Placenta Recovery Essence Facial smooths wrinkles, postpones aging processes, and actively nourishes skin. It also helps regain vitality and youthful texture. This nutrient rich treatment has become a huge hit amongst the Hollywood elite and celebs like Jennifer Lopez have been known to use it to reverse signs of aging. The results from just 1 treatment are dramatic and clients can’t believe what a difference they see in their face after the treatment. SPA WEEK PRICE: $50 (vs. Regular Price, $85) … YOU SAVE $35! Our goal is to make your visits to us as important as a balanced diet and regular exercise. So go head and use our spa month specials as a chance to try something new, relieve stress, quit smoking, assist in weight loss and anything else your heart desires. We hope by visiting Dyanna Spa, you will make our spa experience a part of your normal healthy lifestyle. To make an appointment or learn more about the spa week specials at Dyanna Body & Nail Spa visit or call us at (212) 955 -2355. First 1000 followers on DyannaSpaNYC’s Twitter page will be entered to win a FREE manicure/pedicure! 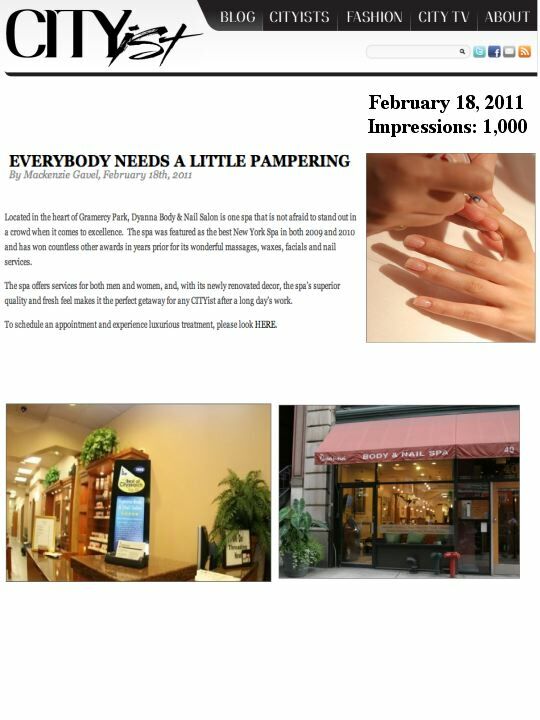 First 100 fans on Dyanna Spa – NYC’s Facebook page will be entered to win a FREE manicure/pedicure!